Hi everyone ! 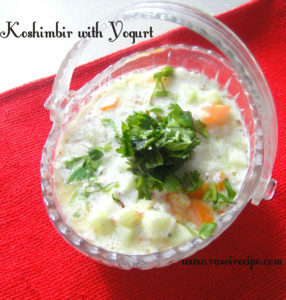 Today’s recipe is my childhood favourite ‘Koshimbir with Yogurt’. 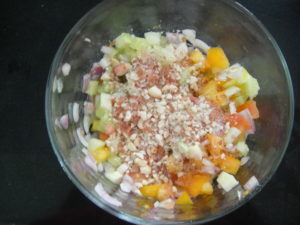 This curd salad was first introduced to me by my aunt (my mother’s friend), she is from Maharashtra and cooks delicious authentic Maharashtrian food. You can have koshimbir with any of your three meals. I love to eat it with parathas and sometimes like a small meal. It is a less than 10 mins recipe. Try this at home and let me know in the comment section below what do you think of koshimbir. You can share your re-creation of this recipe or any other recipe from Rasoi Recipe on our Facebook page or directly mail it to me on rasoirecipe@gmail.com . I would love to hear from you guys. ? 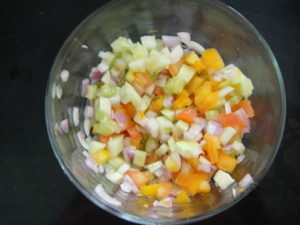 Wash and cut all the vegetables into small cubes. 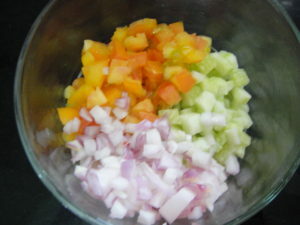 In a bowl add chopped cucumber, onion and tomatoes. Mix everything nicely. In the mix of vegetables add roasted and crushed peanuts, give everything a nice mix. 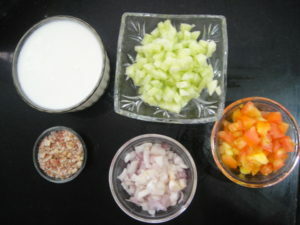 Now add curd/yogurt in the above mix. 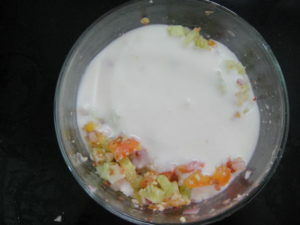 Keep this curd, peanuts and vegetables mix aside. Start preparing tempering. Heat oil in a pan. 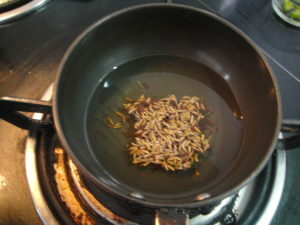 Add cumin seeds and mustard seeds. Let them crackle. 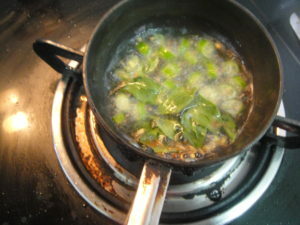 Now, add curry leaves and green chillies. Fry for 1-2 mins without burning them. Switch off the flame and add asafoetida. Temper koshimbir. Add salt and sugar, mix everything gently. Garnish with chopped coriander leaves. Refrigerate it for 10-12 mins. Koshimbir with yogurt is ready to serve ! If you are on diet, you can skip sugar and tempering. 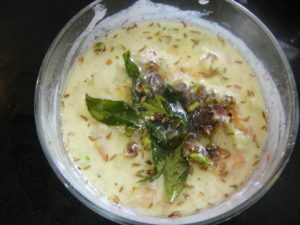 You can add chopped coriander and curry leaves in the curd, cucumber and peanuts mix. Salt can be added while serving also. Roasted peanuts absorb all the water/juice released by the vegetables. If your curd is of thin consistency you can increase quantity of peanuts. You can also add carrots in this recipe. This looks tempting.I love having curd and this looks perfect.I will try it out.Never tried tempering curd,this will definitely be something new to try. I am so happy that you loved it. ? Thank you so much dear for such a sweet comment. ? oohh, I’ve never had anything like that before.. so interesting! Do try it Sybil ! I love yogurt! Looks so refreshing!